Any major decision or purchase is a big deal, both emotionally and financially. 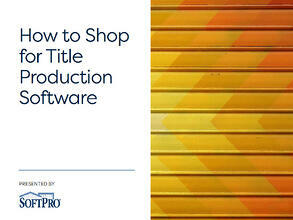 If it happens to relate to your title business, there can be an extra layer of stress. So, if one of your looming choices this year is to select a new title production software vendor, we're here to take that angst away. Your production software should be a tool that helps you save time and money, not be a hindrance. When searching for a new provider, you need to make sure to evaluate everything a company has to offer, not just its sales pitch. Find a company that's more than just a software supplier. Your production software should be a tool that helps you save time and money. Innovation occurs every day, and you want to align yourself with a provider that pushes you forward and never holds you back. Before making a software commitment, title professionals owe it to themselves and their team to shop around for the company that best meets their needs. When you're ready, contact us and put our 35 years of experience and proven technological solutions to work for you. To learn more about the 7 questions you should be asking before making a purchase, download our e-book today!